Cells produce proteins in factories called ribosomes that are composed of both protein and RNA components. Production of the major ribosomal RNA (rRNA) components is essential for the growth and proliferation of our cells. The RNA Polymerase I (Pol I) enzyme transcribes the rRNA genes to produce these rRNAs. Uncontrolled transcription by Pol I can disrupt normal cell growth, causing cell death or, potentially, unchecked cell growth and proliferation, and can lead to developmental defects or cancer. The central aim of our research is to understand the molecular mechanisms and control of Pol I transcription of the rRNA genes in cells. To achieve this understanding, we analyse the complex interplay and dynamics between essential and regulatory factors directing Pol I transcription of the rRNA genes and investigate the impact of altered rRNA production on the fate of the cell. The essential transcription factor SL11binds the rRNA gene and specifically recruits the Pol I enzyme, a key step in the transcription cycle. Our discovery that one of the subunits of this SL1 complex, TAFIB, has structural and functional similarity to transcription factors of the Pol II and Pol III systems, suggests that the fundamental roles of such factors in transcription have remained essentially unaltered in evolution despite the specialization of RNA polymerase systemsin eukaryotes2. We have also demonstrated that an enzyme that changes the extent of supercoiling of DNA, DNA topoisomerase IIα, facilitates the formation of a protein complex essential for the first steps in Pol I transcription that includes Pol I and transcription factors SL1 and UBF3. This finding reveals an important dimension to the mode of action of anti-cancer drugs targeting TopoII. In cells, DNA is compacted with histone protein complexes (chromatin) that decrease the efficiency of transcription and our data suggest that Pol I is aided by histone chaperone complex FACT, which moves histone proteins out of the path of the transcribing Pol I enzyme4. 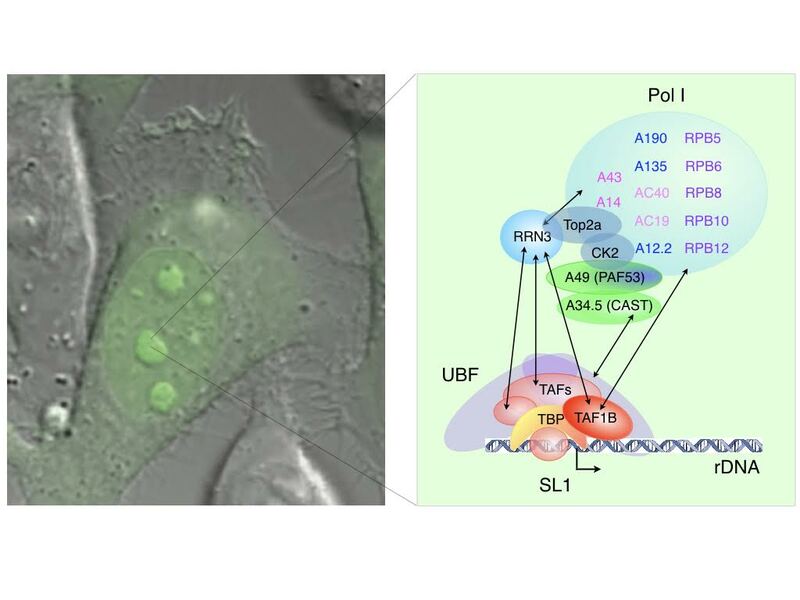 Pol I transcription can be upregulated by UBF5and we have uncovered the key proteins that drive the interaction of Pol I with UBF in the nucleolus and determined that modulating this interaction downregulates Pol I transcription and restrains cell proliferation. We have made recent advances in analysing SL1, UBF and Pol I complexes in the context of chromatin. Our state of the art mass spectrometry facilities have facilitated the analyses of these dynamic proteomes and have uncovered potential regulatory protein networks that link the Pol I transcription machinery to signalling pathways, chromatin-remodelling and modification, DNA replication and repair and transcription regulators. This area of research has opened up a fertile ground for future exploration. Ultimately, our research is anticipated to drive the design of novel compounds to target rRNA synthesis in cells. Such compounds are useful analytical tools and, potentially, could be developed into drugs for the treatment of human diseases linked to deregulation of rRNA production.